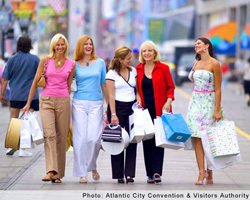 Atlantic City has many wonderful places to shop. Some of them are show below. The Walk connects the Boardwalk with the Atlantic City Convention Center along Michigan Avenue. It features almost one hundred nationally-recognized factory outlet retailers. The Playground (previously The Pier Shops at Caesars) is a shopping mall located on the four-story Pier at Caesars on the Atlantic City Boardwalk. 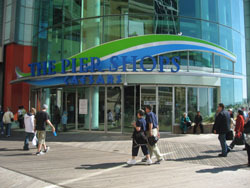 The Pier Shops are connected by a bridge over the boardwalk to the 2nd floor of the Caesars Casino. You can also enter the Pier on the first floor directly from the boardwalk. 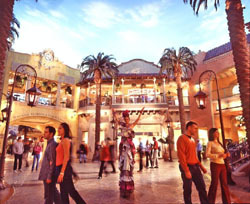 The Quarter, at the Tropicana Casino, is an indoor shopping, dining and entertainment environment based on the traditional architecture of historic Havana. The Quarter is just a block from the boardwalk at Pacific Avenue. The Hamilton Mall at 4403 Black Horse Pike, Mays Landing . This mall has a J.C. Penny's, Macy's and Sears. It also has 140 specialty stores, restaurants and a food court. The Shore Mall at 6725 Black Horse Pike, Egg Harbor Township. 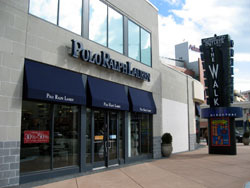 This mall has 60 stores and restaurants, which include Boscov's, Value City, Burlington Coat Factory and TGI Friday's.